- Improved History cleaning for Internet Explorer 10. 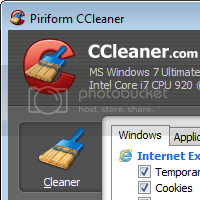 - Optimized Cache cleaning for Internet Explorer 10. - Improved Download History cleaning for Firefox. - Improved DOMStore cookie cleaning for Internet Explorer 10. - Optimized detection of Google Chrome Startup items. - Improved drive detection in File Finder. - Improved System and Browser Monitoring (Pro Version). - Added cleaning for Adobe Fireworks 6.0, Nero 12 Platinum HD Suite, Foxit Reader 6.0, Virtual Clone Drive, PDFCreator and PDF Architect. - Improved cleaning for Freemake Video Converter. I use it all the time personally and on other peeps computers. Glad you like the post, I'll keep the updates coming.